Published a year after Mr. Valentino retired, Valentino: A Grand Italian Epic (Taschen, 2009) is the ultimate Valentino sourcebook. There are stunning archival images dating from the earliest days of Valentino, clips from old reviews and news reports; contributions by Franca Sozzani and Anna Wintour, among many others, and an oral history with anecdotes provided by members of the Valentino tribe, stars such as Sophia Loren and Elizabeth Taylor, major fashion editors and fellow designers, and of course, Mr. Valentino and Mr. Giammetti. This, and much more, makes the book a treasure trove for Valentino fans—and this month and next, we'll be highlighting some of the book's riches. The relationship between Jackie O. and Mr. Valentino began in the simplest way possible: In 1962, while she was still First Lady, Jackie Kennedy admired another woman's dress. 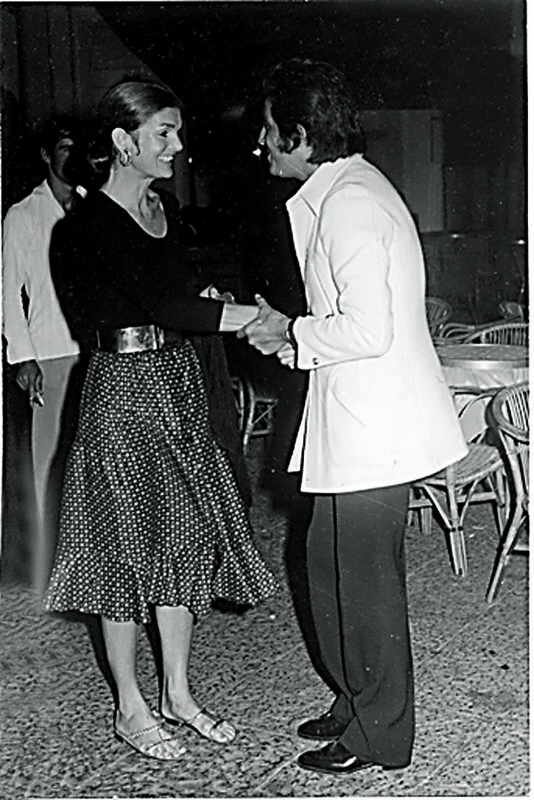 That woman was Gloria Schiff, twin sister of Valentino tribe member Consuela Crispi. An introduction—and a small fashion show in Schiff's apartment—was promptly arranged. After President Kennedy's assassination, her relationship to the brand—and to Mr. Valentino—became closer. Consuela Crispi: "I was playing tennis with Jackie Kennedy at the River Club one morning and she seemed a bit down. This was some time after the assassination, when she was really in mourning and feeling very reclusive and discreet and down. She said, 'Honestly, even if I wanted to go out, I have nothing to wear.' So I said, 'Look, I don't want to push anyone on you,'—because she was very careful about who she saw and what she did, and I never thought it would happen anyway—'but Valentino's in town, and I know he'd love to show you some of his clothes. If you want, I can call him for you.'" "And so he jumped at the opportunity and went to her apartment with his model and, as luck would have it, Jackie fitted into the model's clothes beautifully. So, right then and there, she went wacko, and got a lot of things from Valentino and then started going out. And it lifted her spirits a lot." Though Jackie Kennedy—later Jackie Onassis—frequently wore Valentino, there were two events that cemented her association with the house in the public's eye. 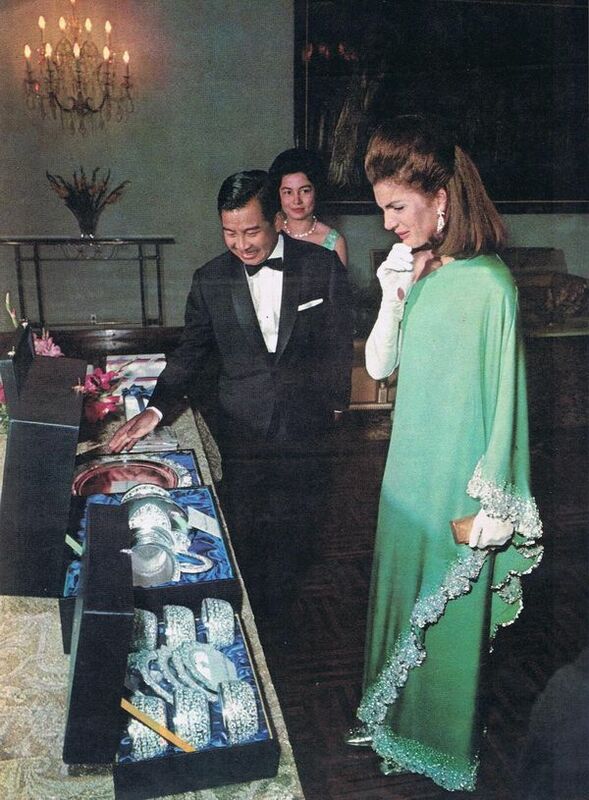 First, in 1967, Mr. Valentino outfitted Jackie for her official visit to Cambodia, where she wore, most famously, that iconic jade-colored, silver-embroidered, one-shoulder Valentino gown. The second event was her wedding a year later to Aristotle Onassis. 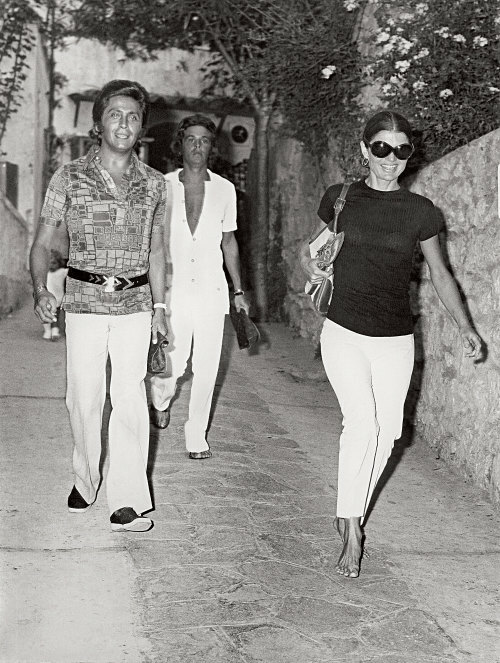 Mr. Valentino: "It was announced on television and in every magazine and every newspaper that Jackie Kennedy would marry Aristotle Onassis in the month of August on the Greek island of Skorpios. Automatically Women's Wear Daily called the fashion house in Rome—because they knew she had Valentino clothes—asking if we knew which kind of dress she was wearing for the wedding. I swore to God I didn't know. I really didn't know, and I said, 'No.' They didn't want to believe me. But anyway, they were used to following her around the city, and they saw her going into Adolfo, who used to make hats and things. She bought a ribbon in a sort of ivory color, and immediately they made a connection with a dress she had ordered maybe two months before, in ivory silk and lace. The sort of sweater with a pleated skirt. They guessed, but they were right; that dress was the one. It was from the white collection."